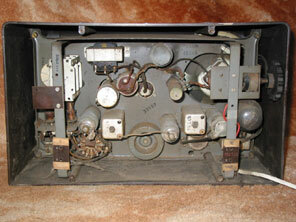 Shown above is the U102A from 1947. Well what to make of this set? – from the look of it you would think something had happened to the photo rendering. But yes it is that hammered metallic silver, with a sickly yellow tuning glass. 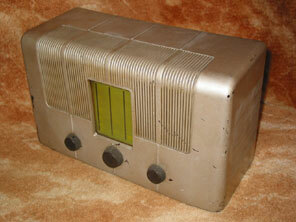 This is an updated version of the U102 that appeared in 1946. The bakelite cabinet first appeared in a rather more restrained finish of black with the close set vertical paralled extruded section at the front leading over the top highlighted in white (seen for example in the B119). I am really not sure how many customers this futuristic hammered silver/yellow colour combination would appeal to, but it is the original finish. There are some other unlikely design ideas incorporated too. 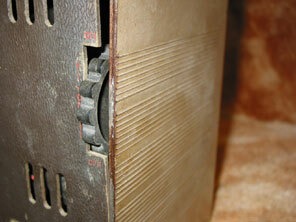 The on/off switch is at the rear of the receiver, combined with the tone control, in the form of a wheel protruding through the back panel (see picture below left). Surely the on/off switch would be better placed at the front, combined with the volume control? Notice also the size and depth of the flywheel provided to ensure smooth tuning. 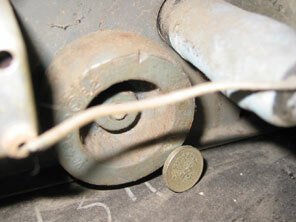 Placed next to it is a pound coin (below right) which gives some idea how massive and heavy the flywheel is. It’s way too large for the job, but this receiver does seem to have stretched the innovative nature of Murphy Radio to excess all round! Valve line-up is TH233, VP133, HL13DD, PEN383, U403.